Volkswagen says 11 million vehicles worldwide are involved in the scandal that has erupted over its rigging of US car emissions tests. It said it was setting aside €6.5bn (£4.7bn) to cover costs of the scandal. VW chief executive Martin Winterkorn issued a fresh apology for the test-rigging, saying he was "endlessly sorry" for the "manipulation". Earlier, the boss of Volkswagen's US business, Michael Horn, admitted the firm "totally screwed up". 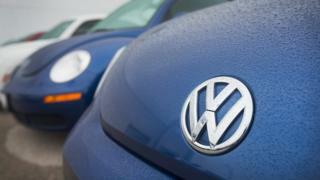 VW shares were down almost 17% on Tuesday in Frankfurt, after losing 19% on Monday. Cars and the environment - two things that Germany cares so deeply about that they form part of the national character. So Germans are shocked to discover that for years the country's mightiest car manufacturer Volkswagen has been rigging environmental tests for diesel emissions in the US. It's as if the British suddenly found out that the Queen had a hand in fixing the horse races at Ascot. One German newspaper has called it the "most expensive act of stupidity in the history of the car industry". Stupid because manipulating pollution data to boost sales can only be seen as a slap in the face to customers who paid a premium for what they thought was a greener car. Since the company owned up, its shares have plummeted by more than a third in just two days. Last Friday, the US Environmental Protection Agency (EPA) said VW diesel cars had much higher emissions than tests had suggested and that software in several diesel cars could deceive regulators. Mr Winterkorn said VW would co-operate fully with the US authorities. In a video statement on the company's website, he said it had "betrayed the trust" of millions of people. He added: "Swift and comprehensive clarification has now utmost priority. "To make it very clear, manipulation at VW must never happen again." In an earlier statement, VW said provision for the scandal would be made "in the profit and loss statement in the third quarter of the current fiscal year". This would pay for "necessary service measures and other efforts to win back the trust of our customers". It added: "Due to the ongoing investigations, the amounts estimated may be subject to revaluation." Transport Secretary Patrick McLoughlin said: "We are closely monitoring the situation and have been pushing for action at a European level for more accurate tests that reflect driving on the road. "It's vital that the public has confidence in vehicle emissions tests and I am calling for the European Commission to investigate this issue as a matter of urgency." Meanwhile, German Chancellor Angela Merkel called for "full transparency" from VW in clearing up the case. "The [German] transport minister is in close contact with the company, VW, and I hope the facts will come to light as soon as possible," she told reporters. Earlier, French Finance Minister Michel Sapin also called for an EU inquiry, but a UK car industry spokesman said there was "no evidence" of cheating. In its latest statement, the firm said it was "working at full speed to clarify irregularities" concerning what it called "a particular software used in diesel engines".